The Rongcheng Shidaowan Nuclear Power Plant is China's first high temperature gas-cooled pebble bed reactor power plant. The expected project construction period from pouring the first tank of concrete to generating electricity for the grid is scheduled to be 50 months. The current plan aims for feeding electricity to the national power grid in 2013. 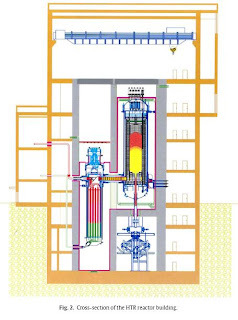 The HTR-PM plant will consist of two nuclear steam supply system (NSSS), so called modules, each one comprising of a single zone 250MWth pebble-bed modular reactor and a steam generator. The two NSSS modules feed one steam turbine and generate an electric power of 210MW. A pilot fuel production line will be built to fabricate 300,000 pebble fuel elements per year. This line is closely based on the technology of the HTR-10 fuel production line. 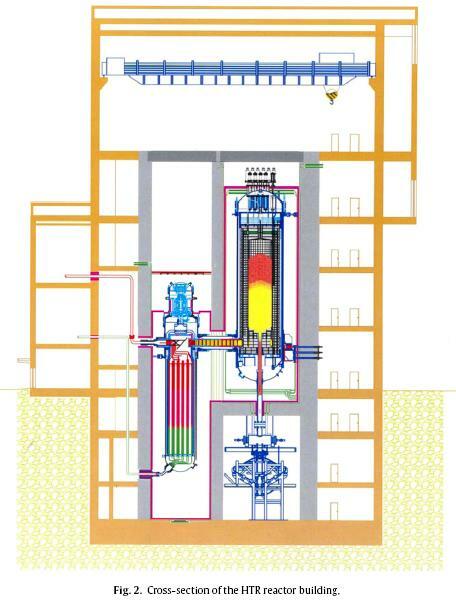 The reactor site has been evaluated and approved; the procurement of long-lead components has already been started. The spherical fuel element with a diameter of 60mm contains a multitude of ceramic coated particles. 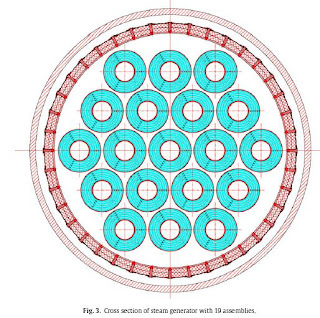 The coated fuel particles are uniformly embedded in a graphite matrix of 50mm in diameter; while an outer fuel-free zone of pure graphite surrounds the spherical fuel zone for reasons of mechanical and chemical protection. Each spherical fuel element contains about 12,000 coated fuel particles. (1) Demonstration of inherent safety features: the inherent safety features of modular HTGR power plants guarantees and requires that under all conceivable accident scenarios the maximum fuel element temperatures will never surpass its design limit temperature without employing any dedicated and special emergency systems (e.g. core cooling systems or special shutdown systems, etc.). (2) Demonstration of economic competitiveness: the first HTR-PM demonstration power plant will be supported by the Chinese government, so that the owner can always maintain the plant operation and obtain investment recovery. However, this government supported demonstration plant has to prove that a cost overrun during the construction period will be avoided and that the predicted smooth operation and performance will be kept. Hence, the demonstration plant must clearly demonstrate that follow-on HTR-PM plants will be competitive to LWR plants without any government support. (3) Confirmation of proven technologies: in order to minimize the technical risks the successful experiences gained fromthe HTR-10 and from other international HTGR plants will be fully utilized in the HTR-PM project. 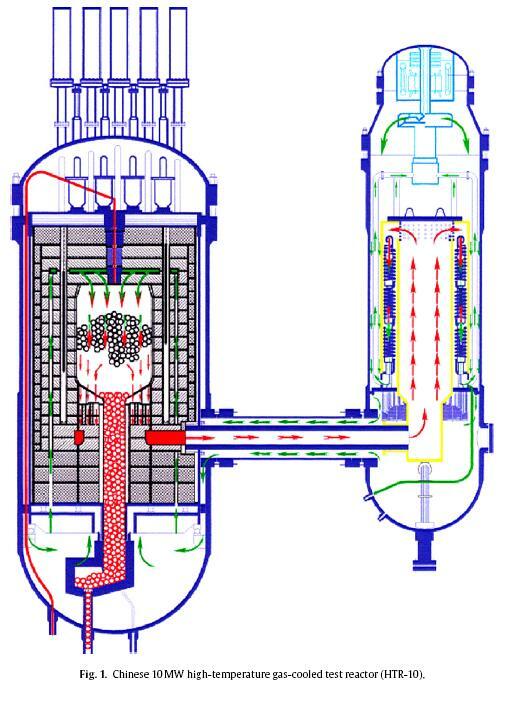 The HTR-PM reactor design is very similar to the HTR-10. The turbine plant design will use the mature technology of super-heated steam turbines which is widely used in other thermal power plants. Besides, the manufacture of fuel elements will be based on the technology verified and proven during the HTR-10 project. 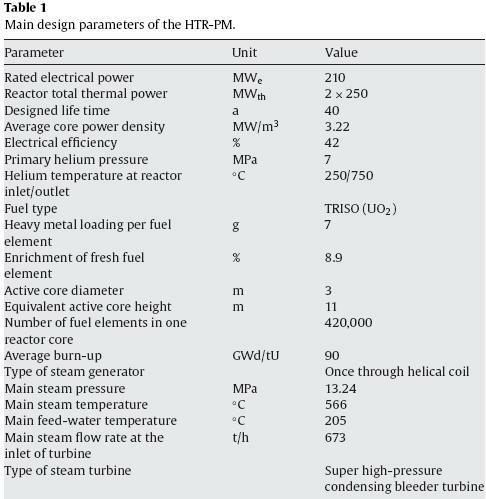 (4) Standardization and modularization: the HTR-PM demonstration plant, consisting of two pebble-bed module reactors of combined 2×250MWth power, adopts the operation mode of two modules connected to only one steam turbine/generator set. This design allows to demonstrate the advantages and key benefits of employing and implementing a design of standardization and modularization. If the construction and operation of the HTR-PM demonstration plant proves to be successful, larger scale HTR-PM plants – using multiple-modules feeding one steam turbine only – will become a reality. (1) Largely enhanced safety features: a successful HTR-PM will have already proven this technical target of Generation-IV nuclear energy systems. 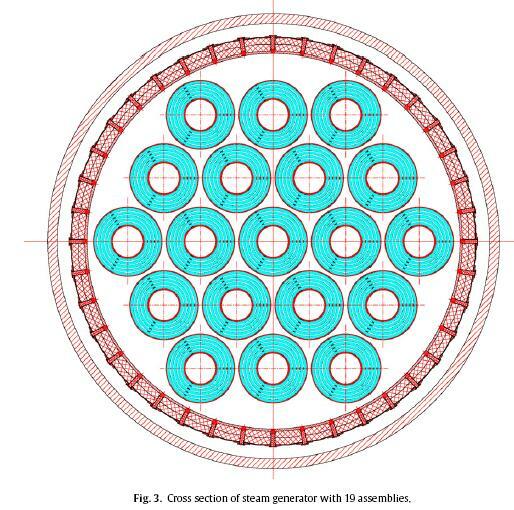 (2) Achieving outlet temperatures beyond 1000 ◦C [very high temperature gas-cooled reactor (VHTR)]: the reactor of current design and using current fuel element technologies has already the potential of realizing a gas outlet temperature of 950 ◦C. A further improvement of the fuel element performance is already foreseeable which will allow reaching this goal of attaining an outlet-temperature of 1000 ◦C. (3) Hydrogen production, use of helium turbine or supercritical steam turbine: the current reactor design, verified by the HTR-PM, can readily be applied for the helium turbine or super-critical steam turbine or for the generation of large-scale production of hydrogen by nuclear energy. HTGR plants can achieve a thermal efficiency of 42% by even employing subcritical superheated steam turbines or reaching ∼45% when supercritical steam turbines are installed. The efficiency could be improved even further when adopting direct helium gas turbines with recuperators or when choosing a combined cycle. On the basis of the HTR-10, the ongoing Chinese HTR-PM project is considered to be a decisive new step for the development of Chinese HTGR technology. Its main target is to finish building a pebble-bed HTR-PM demonstration plant of 210MWe around 2014-205. 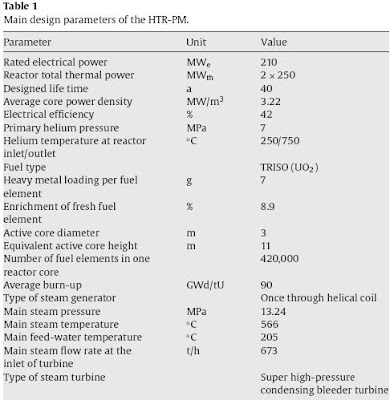 Through the mutual efforts of all relevant scientific research organizations nd industrial enterprises, and having the strong support of the Chinese government, the HTR-PM project will certainly play an important role in the world-wide development of Generation-IV nuclear energy technologies.